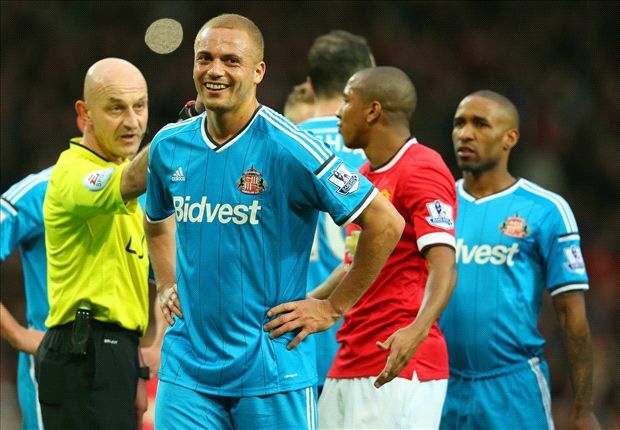 Referee Roger East made a huge error in Manchester United‘s 2-0 win over Sunderland, sending off Wes Brown when it was John O’Shea who should have been given his marching orders. O’Shea brought down Radamel Falcao in the box, with Wayne Rooney converting the subsequent penalty, but the official instead gave the red card to the Irishman’s defensive partner Brown. O’Shea attempted to correct the official, but Brown was still dismissed in the 64th minute. The pair, both former United players, had performed well until the concession of the spot-kick, with the game goalless at Old Trafford ahead of Rooney’s strike.